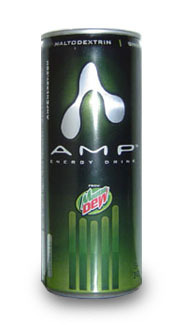 AMP is an energy drink produced and distributed by PepsiCo under the Mountain Dew soft drink brand. It was launched in 2001 to compete with Red Bull. The beverage is available in 8.4 fl.oz., 16 fl.oz. (Tall Boy), and 24 fl.oz. (Big Rig) cans and made with Mountain Dew's base flavor formula. It also contains MDX5, taurine, ginseng, B-vitamins, guarana and maltodextrin. AMP builds on its sports racing image and branding, and sponsors NASCAR driver Kevin LePage and the #61 team.